1. An active sensitization or the introduction of allergens into the body. 2. The process of becoming sensitive to an allergen. 1. A rule relating to the solution of questions concerning the compounding or mixing of different ingredients, or ingredients of different qualities or values. 2. The act of tying together or attaching by some bond, or the state of being attached. 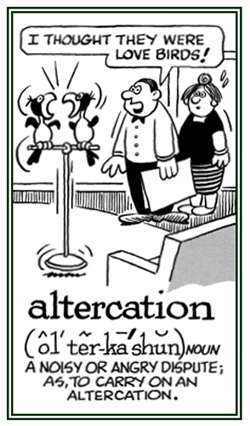 Two or more words that have the same initial sound or sounds that occur in a phrase or a line: "The following are examples alliterations: a babbling brook; in the wild and wooly." The process of developing different biological groups as a result of members of the population that have different breeding seasons or patterns, or differing in the use of time during the day or night, rather than through geographic separation. Reciprocal transformation of two mutants to the wild type by the action of a transforming principle obtained from the other one. The replacement of lost or damaged bodily tissue with an allograft or surgical substitute of a body part from one individual to a different person: An allotransplantation includes cornea (transparent front of the eye), cartilage (rubber-like padding that covers and protects the ends of long bones at the joints), bone, arteries (vessels that carry blood away from the heart), and cadaver (dead-body) epidermis that is stored in a skin-tissue bank. Allotransplantation involves the moving of a part from one individual into another one which are usually not related to each other. The depositions or formations of sediments or materials that have been carried and left on land areas by running water; such as rivers or streams: Alluviations are the results of sand, silt, mud, or other detritus (loose materials) left by flowing water in river beds, flood plains, lakes, etc. Putting something in alphabetical order (customary order of the letters from "a" to "z"). 1. The act or procedure of becoming different. 2. A condition resulting from a modification. 3. An event that occurs when something passes from one condition or phase to a another one. 1. A vehement, heated, or angry dispute: The two youths got into an altercation on the playground while they were playing soccer. 2. A noisy argument or controversy: The verbal altercation which Alex observed did not appear to be aggressive so he didn't try to intervene. 3. 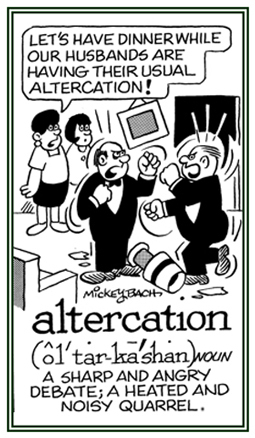 Etymology: from Latin altercari "to dispute (with another)"; from alter, "other". © ALL rights are reserved. 1. A successive change from one thing or state to another and back again. 2. Repeated rotations: People expect to experience alternations of the seasons. 3. In linguistics, a variation in the form of a language as it occurs in different environments or under different conditions. 1. An activity, process, or result of combining or uniting something: There has been an amalgamation of the two competing companies into one organization. 2. The mixing of mercury with another metal, or metals, to form an alloy: The jewelry manufacturer used an amalgamation of silver and stronger metals to create a design that was both durable and beautiful. 3. The process for the separation of metal from a base ore using such a chemical as mercury: The mine engineer explained that the amalgamation of gold was a complicated chemical process. Showing page 6 out of 96 pages of 1437 main-word entries or main-word-entry groups.